the thing i love about nigella’s granola recipe (yes, the one that everyone raves about all over the net) is that it features apple sauce as a substitute for copious amounts of oil. yes, it’s healthier, has got more crunch, but more importantly, it is a very good recipe for expending excess pears! [i’ve only got 3 more pears left, btw, after this]. i suppose the other fantastic aspect of her granola recipe is that it’s one that you can very easily adapt to make your own or personalise for a dear friend. Mix everything together, except for the dried fruits. (this is important! 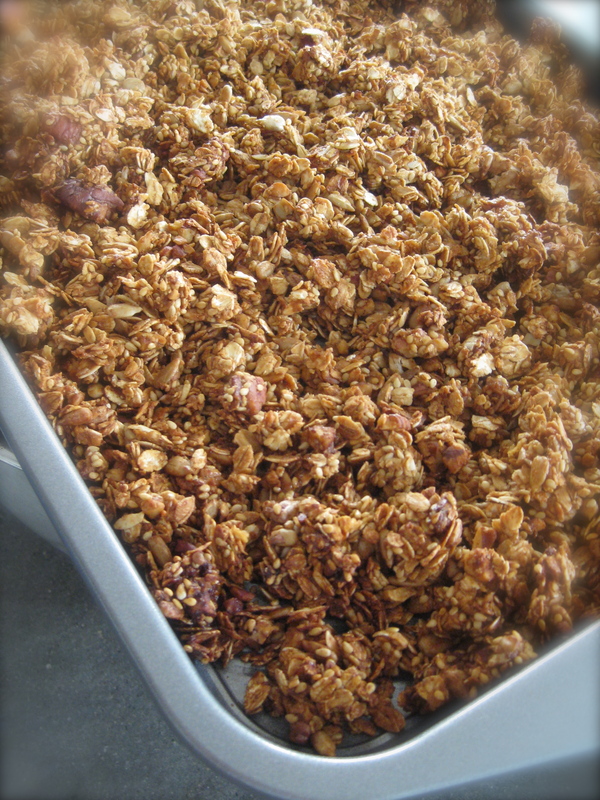 if you bake the dried fruits, they will turn out to be these hard inedible specks ruining the consistency of your granola). Spread evenly only two baking sheet — preferably non-stick and with sides. When room temperature, add in dried fruits and mix together. I usually store my granola in a ziploc bag.